This is the last of the Rivendell series. Well, not the very last, in terms of the overall film: I did post a set of caps for the EE scene of the departure from Imladris two years ago (see link at bottom of page). But this is the last entry in the current series. For this post, I just want to say how much I love the book excerpt quoted below. 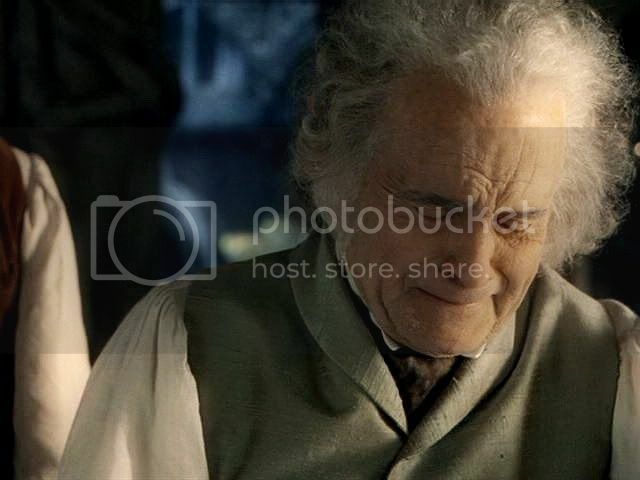 Bilbo is deeply moved, but waves off Frodo's heartfelt thanks with a laugh and a dose of his hearty manner, changing the subject. But as if he's wandered into yet another tender area, he breaks off, looks out the window and sings a little song. 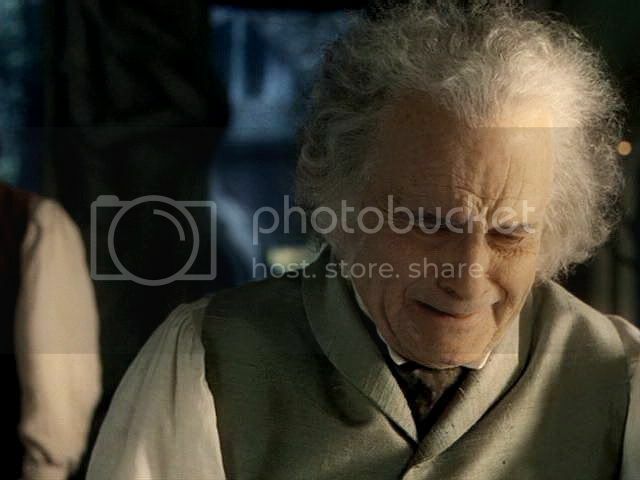 "He always used to joke about serious things," Frodo observed to Gandalf seventeen years earlier. 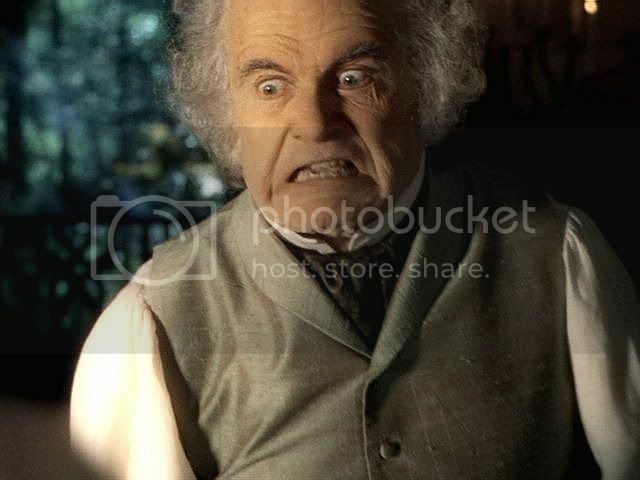 It is like Bilbo to deflect open emotionalism with a bluff manner and a bit of humour. 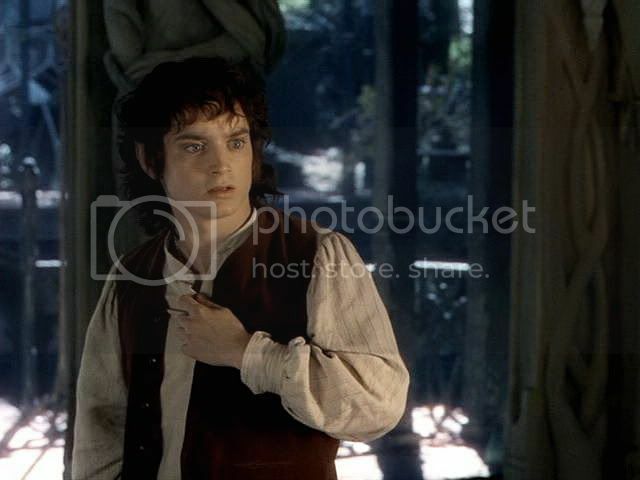 It is not only like Bilbo, it is like most hobbits. 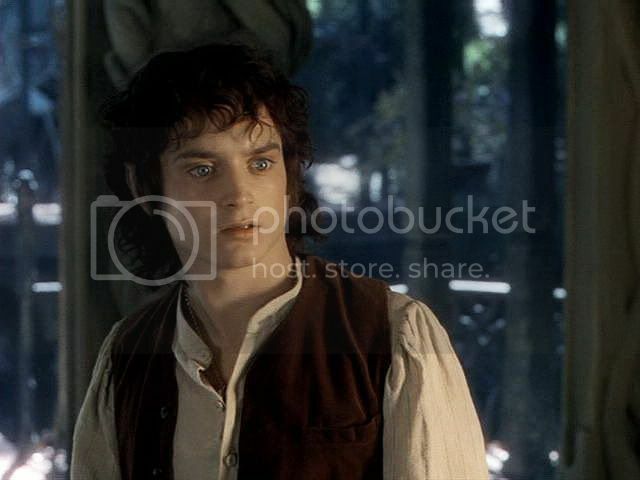 As Merry explained to Aragorn in the Houses of Healing, "it is the way of my people, to use light words at such times and say less than they mean. We fear to say too much. It robs us of the right words when a jest is out of place." 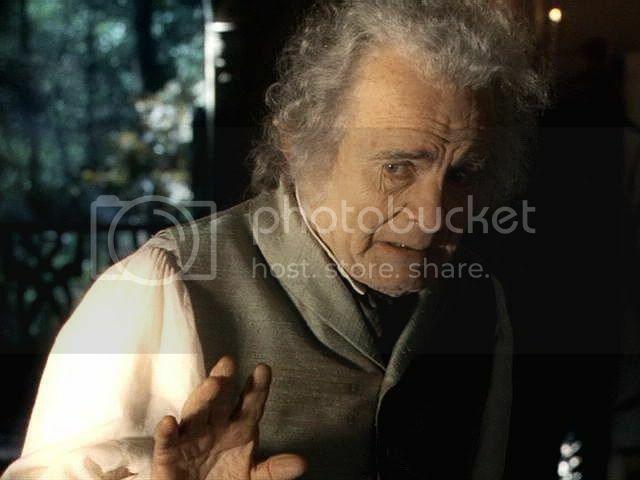 But the song Bilbo chooses to sing is very apt for the occasion, and I have always wondered if he was supposed to have made it up on the spot, or if it was something he'd sung for years and pulled out to express his feelings at that moment. It is pensive, and threaded with wistful yearning, but obliquely expressed, with a light tone and a modest, homely style. 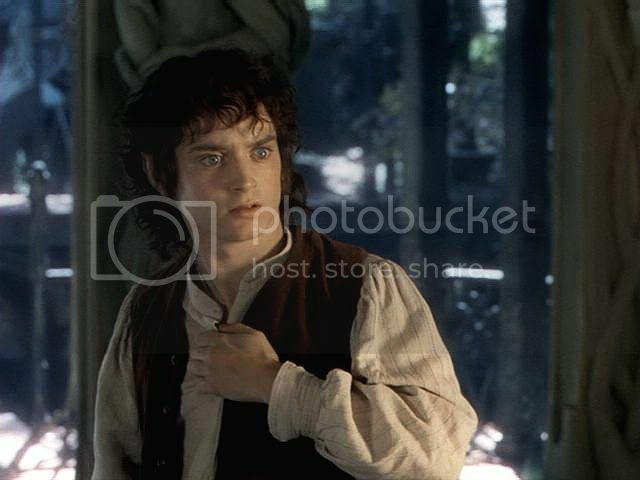 Either way, I am sure its meaning and the sentiment behind it was not lost on Frodo. In addition to the caps, book and film scenes, I am privileged to feature the last poem in the Rivendell Suite. 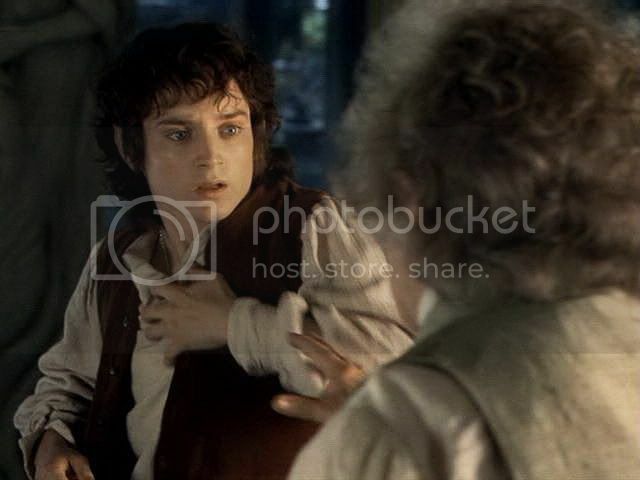 This final installment in the cycle first reflects Bilbo's point of view, then Frodo's. While jan-u-wine has written here to the film scene, she lets the more deeply developed relationship in the book shine through. Book scene: from The Ring Goes South. 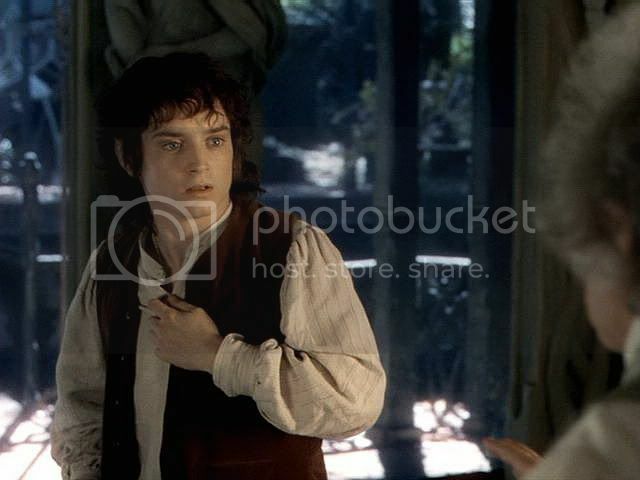 ‘I cannot thank you as I should, Bilbo, for this, and for all your past kindnesses,’ said Frodo. 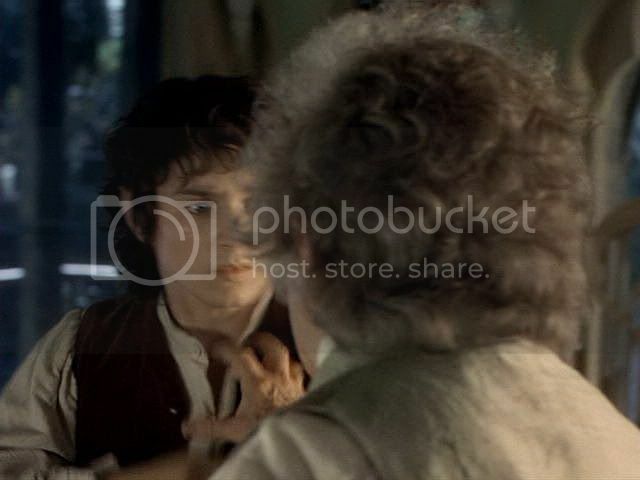 ‘Don’t try!’ said the old hobbit, turning round and slapping him on the back. 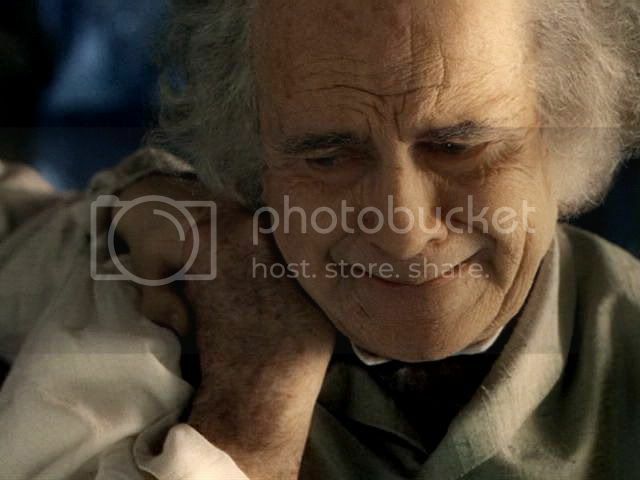 ‘Ow!’ he cried. ‘You are too hard now to slap! 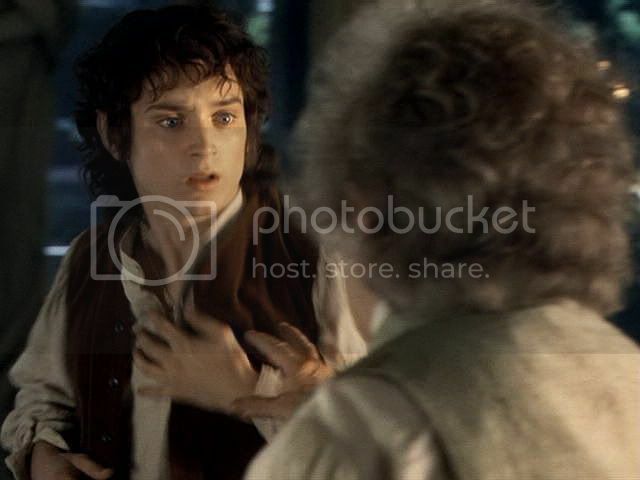 But there you are: Hobbits must stick together, and especially Bagginses. All I ask in return is: take as much care of yourself as you can, and bring back all the news you can, and any old songs and tales you can come by. I’ll do my best to finish my book before you return. I should like to write the second book, if I am spared.’ He broke off and turned to the window again, singing softly. It was a cold grey day near the end of December. The East Wind was streaming through the bare branches of the trees, and seething in the dark pines on the hills. Ragged clouds were hurrying overhead, dark and low. As the cheerless shadows of the early evening began to fall the Company made ready to set out. They were to start at dusk, for Elrond counselled them to journey under cover of night as often as they could, until they were far from Rivendell. 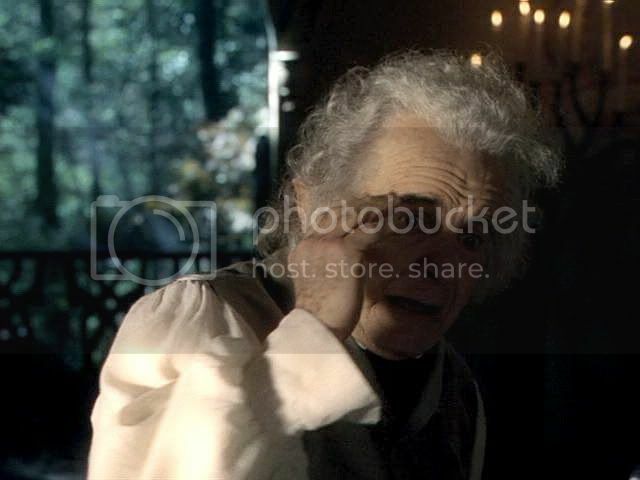 Their farewells had been said in the great hall by the fire, and they were only waiting now for Gandalf, who had not yet come out of the house. A gleam of firelight came from the open doors, and soft lights were glowing in many windows. 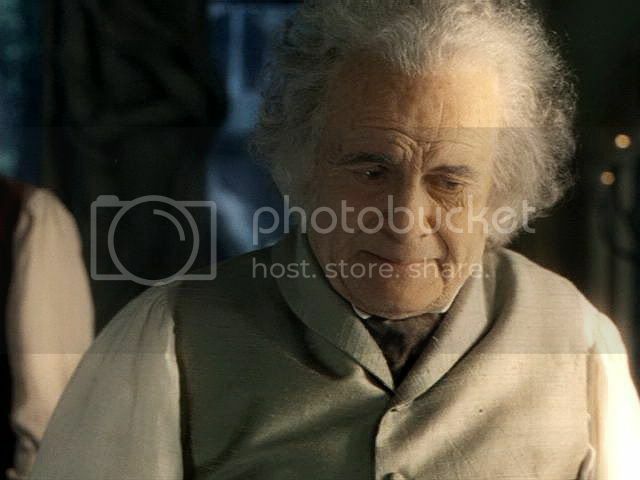 Bilbo huddled in a cloak stood silent on the doorstep beside Frodo. 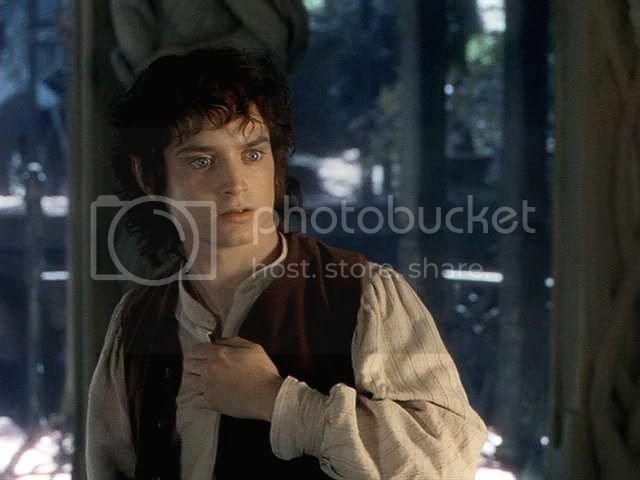 Aragorn sat with his head bowed to his knees; only Elrond knew fully what this hour meant to him. The others could be seen as grey shapes in the darkness. Sam was standing by the pony, sucking his teeth, and staring moodily into the gloom where the river roared stonily below; his desire for adventure was at its lowest ebb. ‘Bill, my lad,’ he said, ‘you oughtn’t to have took up with us. You could have stayed here and et the best hay till the new grass comes.’ Bill swished his tail and said nothing. 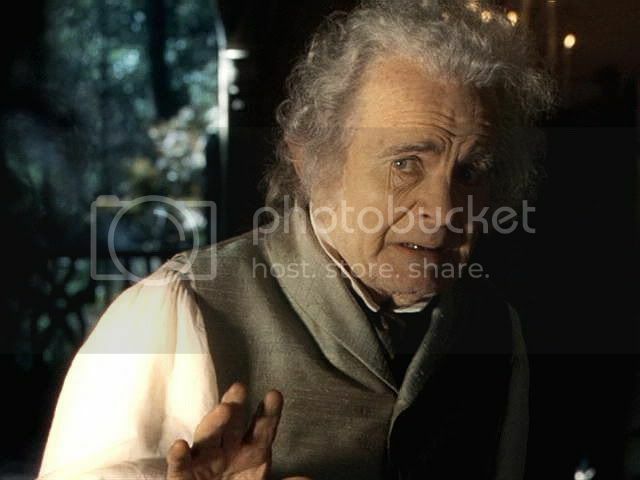 Bilbo: I’m sorry for everything! ~ Riv. 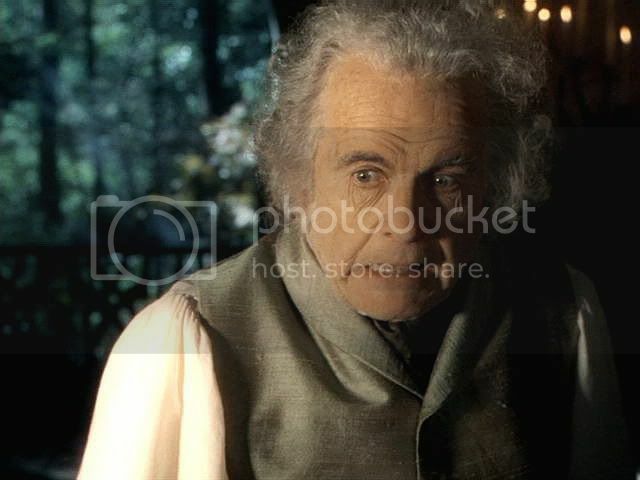 14: Bilbo’s Gifts 3 – Bilbo’s transformation, plus jan-u-wine's Rivendell Pt. 7. ~ Riv. 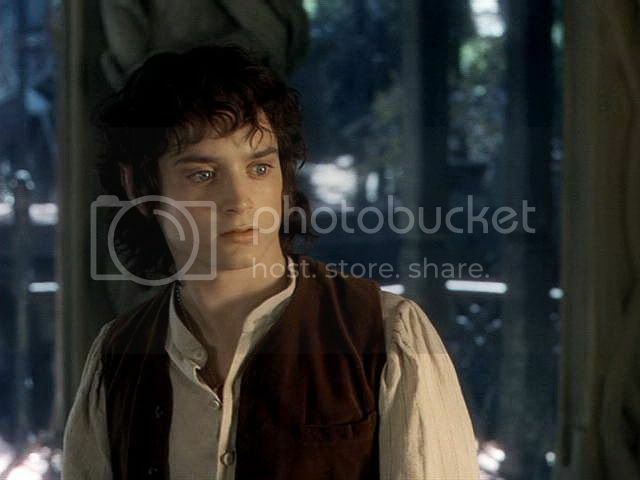 16: Farewell to Rivendell – caps from the widescreen EE version (posted Feb 9, 2007). I can never read those lines without getting chills. So poignant! It hurts to imagine their mood. To know you will maybe never meet again, but you ought not to give up your hope, for this would smooth the way for bad luck and desperation. Also I can almost feel the cold air by reading the scene in the book about the cold and gloomy atmosphere outside when they can see burning fires and soft golden lights in the house. 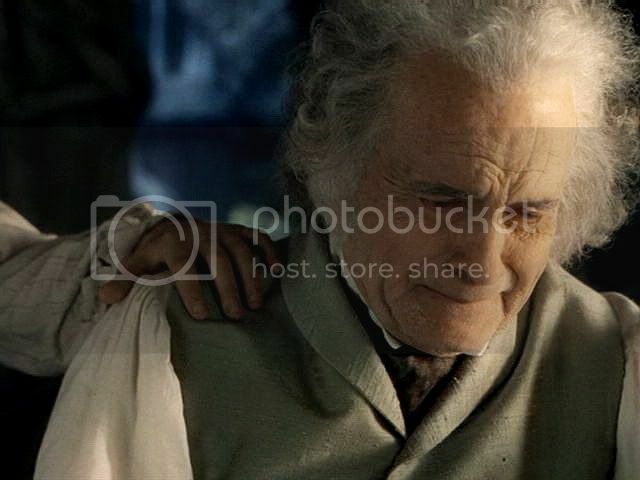 I will ever be glad not to be forced to swap place and situation with them, nor to be a part of their fellowship. And again Jan's poem touched me very deeply! I always need a tissue when I read her works. Also I can almost feel the cold air by reading the scene in the book about the cold and gloomy atmosphere outside when they can see burning fires and soft golden lights in the house. I will ever be glad not to be forced to swap place and situation with them, nor to be a part of their fellowship. That's so well observed, Aredhelebenesse. It's true: it's cold and dark, night falling, when the Fellowship prepare to leave. How they all must long, with a deep longing, to stay there in Rivendell, in the light, in the warmth, in a safe truly *civilized* place. Instead they have to go out into the cold night -- a night in every way. 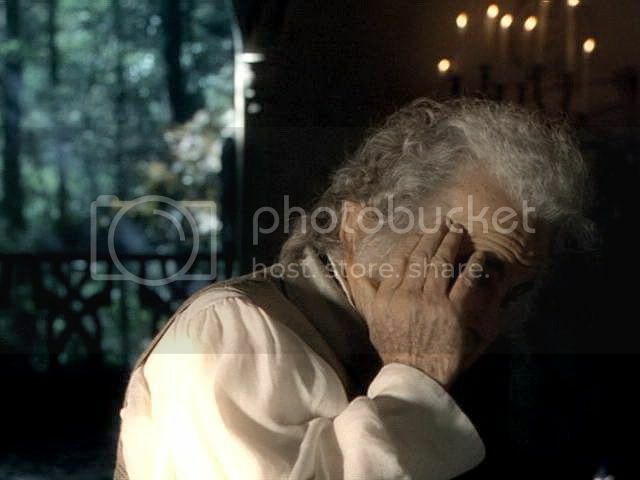 Bilbo in that scene, huddled in a cloak, and silent, perhaps unable anymore to conjure up the slightest semblance of cheer, looks like the scene makes me feel -- dismal and shivery. A most enjoyable series of essays, caps and poems. Thank you, Mechling and Jan. It's a lovely ending to the poem, Estëm, and to the poem cycle, too. Only when put into one continuous document, and read as such, did I realise how well the individual parts of "Rivendell Suite" worked together to make one [highly] satisfying whole. That's a very touching part of the story. 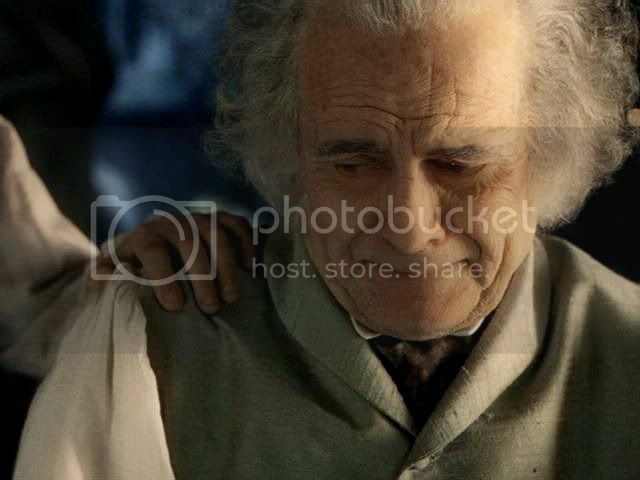 I so love the scene in the movie, it's really sad and full of affection and desperation at the same time. Sorry to be so late in replying, dear! I'd also like to let you know that I finally posted a couple of pics of my wee Red Book (as well as other books in my tiny Bag End).